This is a well known model-kit, a reboxing of the OMEGA offering. Inside you'll find a small kit with around 65 parts. Around 10 of them you can forget, because they are parts for the interior and the model has no open hatches or doors. 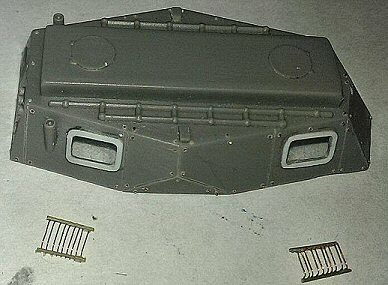 ICM did add one part for the upper hull and one small sprue with antennas and stair to the standard BTR-152 kit. As every time, the building of a model starts with its history and searching for photos, drawings or plans. 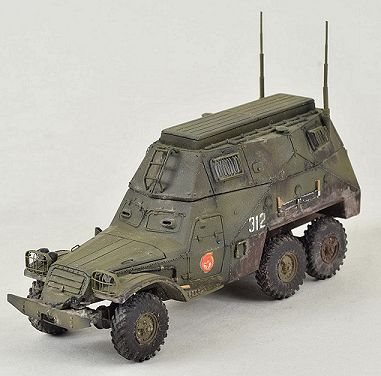 In real life, the BTR-152S modification was a communication, command and control armoured vehicle. There were “S”, “S1”, “S2” and “I” modifications, but I couldn't find any more detailed descriptions and difference between them. Any info about these modifications are scarce due to the low numbers produced. 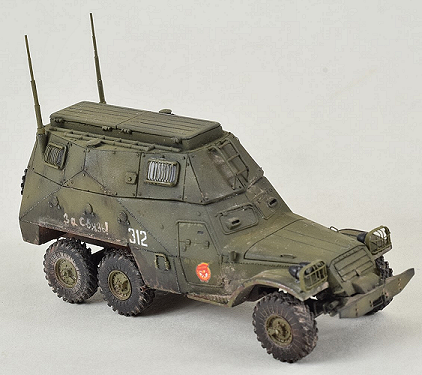 Strangely, a BTR-152 of this mod doesn't not exist in the Russian museums. Now, we can find only one surviving example in Dresden. Firstly, I found some photos of this vehicle in different variants and checked some plans. The biggest problem is the small amount of information available about this modification. 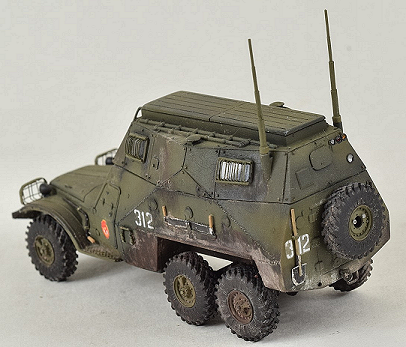 I did not found any good plans of the BTR-152S. The same with photos. 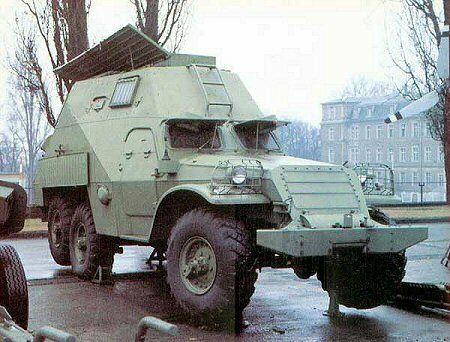 Except for the upper part, the “S” variant was similar to any other BTR-152, so, we can use photos and plans of a standard 152. “Armour collection 5/2001”. Unfortunately this edition is only in Russian language, but you will find there good plans and some photos. 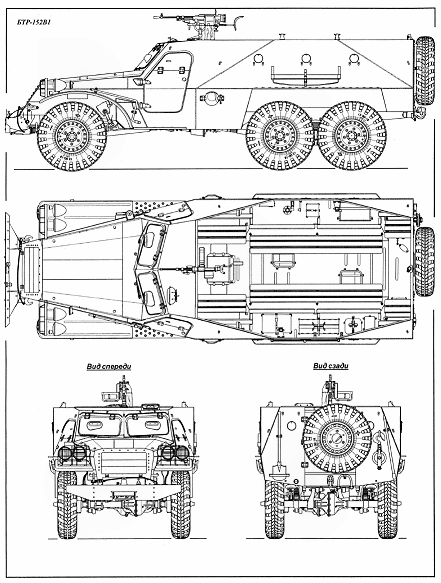 “Maintenance and Operation Manual of Wheel Drive AFV BTR-152”, Defence Ministry of USSR, Moscow, 1957. Also, I recommend to use a “walk-around”, but, be careful! 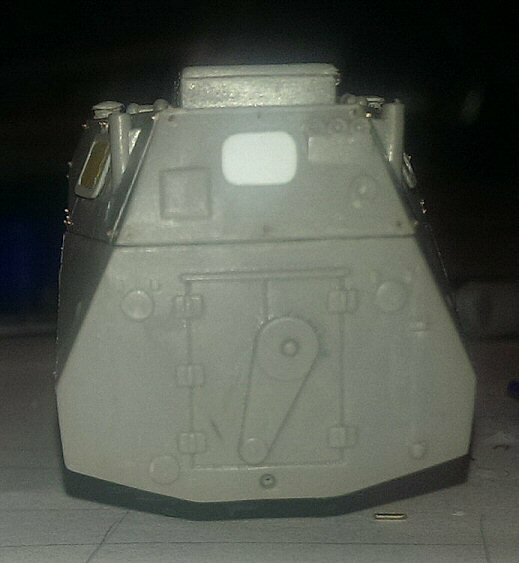 Most of the surviving BTR-152 are not 100% authentic! Usually museums do make some repairs with not original parts. 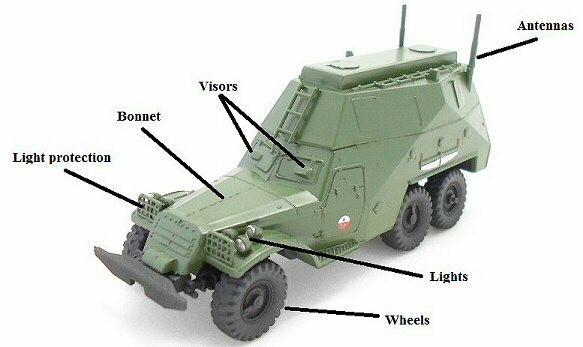 Parts, that “hit the eye” at first look, are bonnet, visors, light protection, lights, wheels and antennas. Bonnet and visors must be reworked, it is not so difficult, and other parts must be replaced. Reworking the visors is not so complicated, I just drilled them out. For the bonnet – I scratched two lines, added two handles and did the welding imitation. The sides should also have a welding imitation. The upper part of the hull on a real “152-S” was assembled with metal sheets, which were riveted, the inner structure being reinforced by brackets. 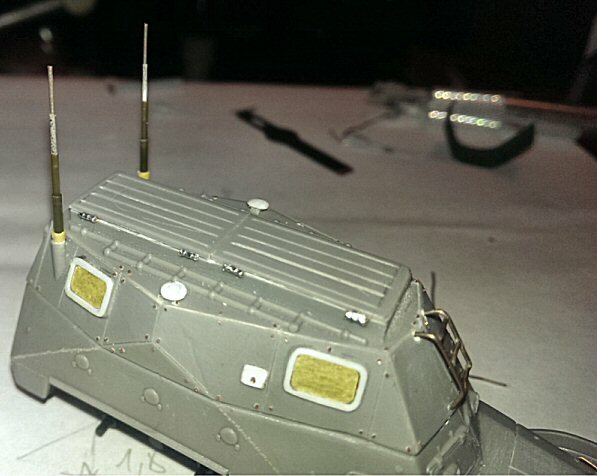 So, it is not difficult to scratch lines of metal sheets and add rivets. I also removed the handsaw. I don’t like it when hand tools are casted with hull parts. Then, I found out that the upper hull part lacks many details, while the roof is incorrect. 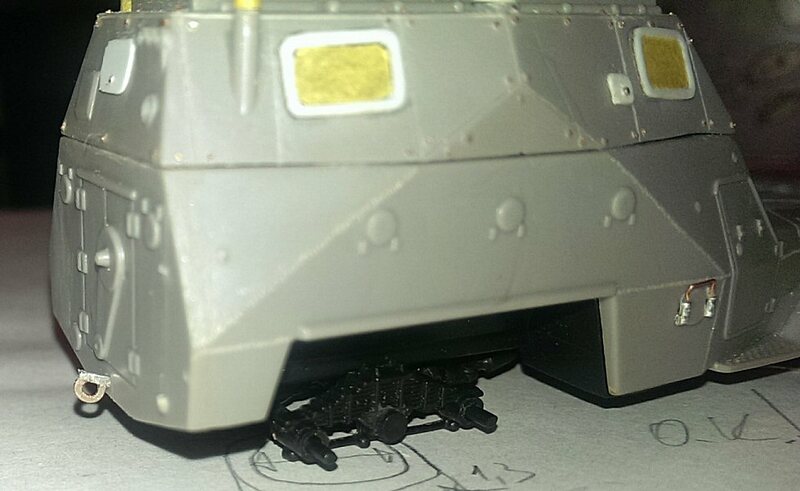 On the model kit there are two round hatches, on real sample – doors. I also found one side view plan for 152 with an “extended” hull. Here we can find windows, their grids and on the bottom – ventilation “mushrooms”. On the ICM-kit there are no mushrooms, there is something resembling pyramids. Also you will find that the stair in the kit is incorrect. 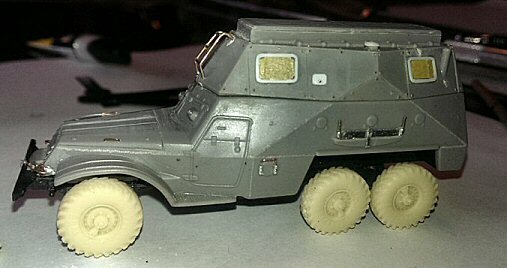 On the bumper rivets must be added and some detail for the winch. 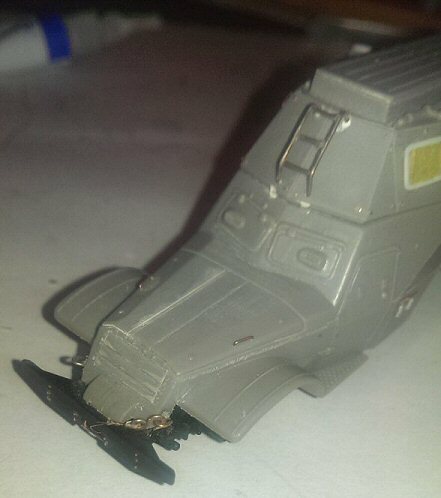 In my opinion it is not a bad idea to add the hook of the winch. This was easily done : prepare the shape of the hook from wire and press it by the grip. Then finish with a needle file. Same with aft hinge. On the backside, I removed the shovel and crowbar and added a hatch. On the right upper corner there are lights that could benefit with some reworking : drill them out, paint them mirror and install lenses. The same procedure was done on the front road lights. 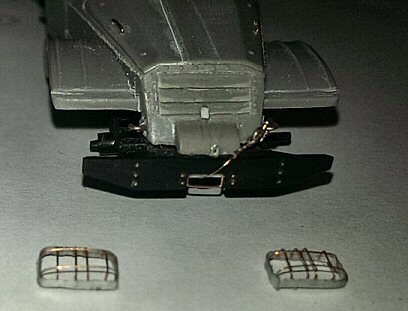 Also there is a towing hinge, which is poorly reproduced in the kit, and if you won't (or can't) read the instructions – you will never understand what that part is. It is better to replace it. As I told earlier, the antennas must be replaced. I did this with simple sprue, using the same method to make standard thin antenna from sprue. Drill the sprue in longitudinal direction, install metal wire in the hole (I used 1 mm, 0,8 mm and 0,5 mm diameter), heat the plastic and stretch. Presto, you will get plastic tube with very thin walls. 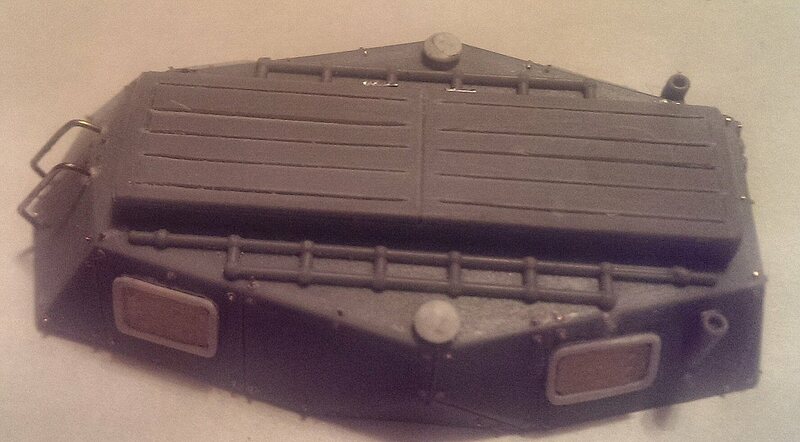 The hinges on the roof doors were made from heated and stretched sprue and 3M aluminium tape. Wind the tape around the sprue and make notches to imitate a hinge. The front lights protection must also be replaced. I used for this the same 3M tape and wire (around 0,15 mm diameter, from a transformer coil) to make a grid. For the final details, I made a shovel, handsaw, crowbar, crank tool for engine manual starting and exhaust pipe. And of course you need to replace the wheels. I used the excellent Balaton Models BM7214 “K-70 wheels set”. 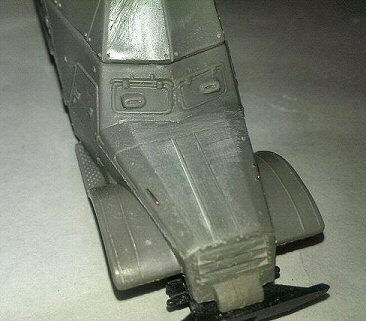 There are 7 resin wheels, highly detailed, very accurate and realistic. Frankly speaking, if I hadn't found this set, I'd never have started reworking and building this kit. I find correct wheels an important detail for vehicles. Of course, this it is not the best kit, but we should note that there is no other BTR-152 available especially a “S” version in 72nd scale. If your are happy what what's in the box, then I can also recommend this kit for beginners. Just assemble it as it is. It will be easy, due to low quantity of parts. 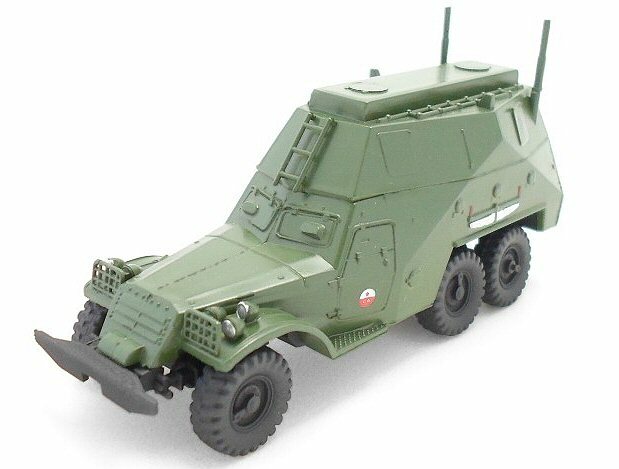 To me, I found this model a very interesting kit to build. When you start reworking it, creating parts as you go along, you'll start liking this model. From this simple kit, you'll receive much fun. You can create any parts, try new techniques and don’t afraid that you can spoil it. You see, here is no photo etching, but I did experiment, and I think, they did not injustice to the model. So, I also can recommend it for advanced modellers, just for fun of building. P.S. The writing on the right side was done by brush and it means “For the Communication Forces”. I’ve done this in honour of my best friend from childhood, Guard’s Senior Lieutenant Dubkov Alexey.